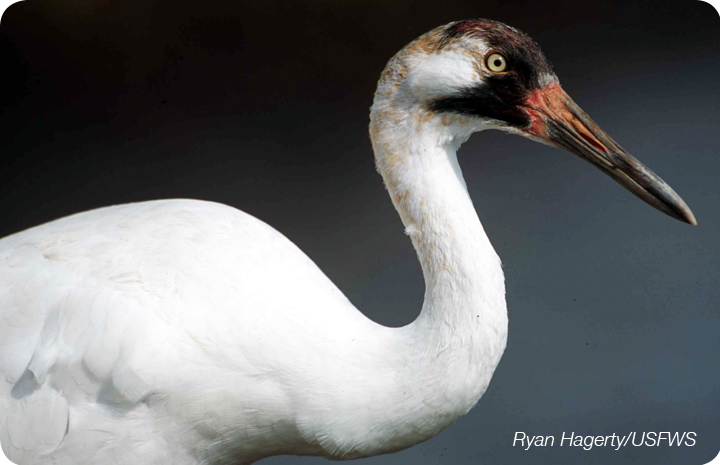 In the 1940s there were fewer than 40 Whooping Cranes left in the wild. Through a captive breeding program, wetland conservation and management initiatives, and other innovative programs, there are more than 400 cranes in the wild today. The only self-sustaining population breeds in Canada and winters in Texas but, thanks to reintroduction programs a migratory population is currently being established in Florida. Since 2001, crane researchers have been using ultralight aircraft to teach young cranes to migrate between Wisconsin and Florida’s Gulf Coast. The young cranes are lead to St. Marks National Wildlife Refuge in the fall, and spend the winter in a special enclosure which safeguards them from predators like coyotes and bobcats. As spring nears, the young cranes are left to fend for themselves, so they can migrate back to Wisconsin where their journey began.